CSR Racing 2 The next chapter to the #1 drag racing franchise of all time has arrived. 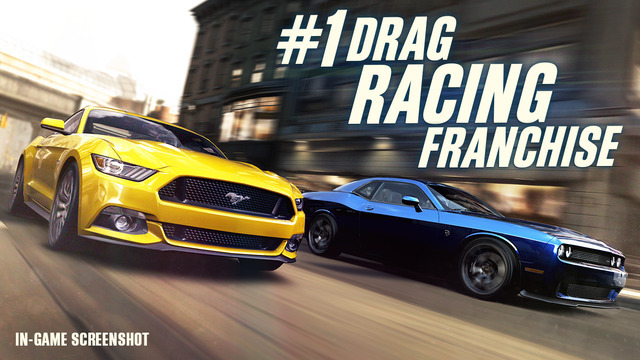 Setting a new standard in visuals, CSR2 delivers hyper-real drag racing to the palm of your hand. Compete against live players across the world with your custom built supercars, including LaFerrari, McLaren P1, Koenigsegg One:1 and many more. CSR2 redefines what you thought possible on your mobile device. Using outstanding 3D rendering techniques, CSR2 features the most beautiful and authentic supercars to date. Now you can get inside every car to reveal its meticulously detailed interior, including original manufacturers trim options. Racing games do not get any more real than this. Collect the supercars of your dreams and show them off in your huge warehouse garage CSR2 features over 50 officially licensed vehicles from the worlds most desirable car manufacturers including Ferrari, McLaren, Bugatti, Lamborghini, Pagani and Koenigsegg. Data connection is required to play. Requires iOS 8 or later. PLEASE NOTE! Must be 13+ to play. CSR Racing 2 is free to play, but it contains items that can be purchased for real money. You can toggle these purchases on/off in the “”Restrictions”” menu on your device. You will be given the opportunity to participate in special offers, events, and programs from NaturalMotion and its partners.